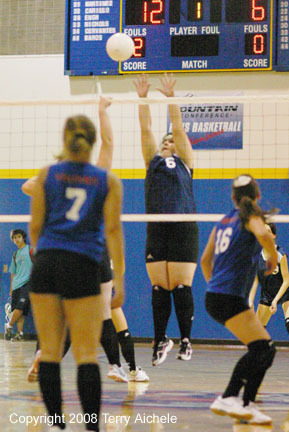 STANFIELD-Stanfield (2A Blue Mountain League) hosted Umatilla (3A Eastern Oregon League) in an early season volleyball match on Tuesday afternoon. Stanfield Tigers won 25-21, 25-11 and 25-14. Stanfield jumped out to an early 7-4 lead in the first game. Umatilla worked their way back to tie it up 17-17 just past the midway point. From that point on Stanfield pulled away slowly to take a 25-21 win. Senior Jade Martinez started the second game serving for ten straight points to take Stanfield out to a 10-0 lead before the first sideout. Umatilla turned the serve right back over to Stanfield and sophomore Joy Brammer then served for seven more points to take the Tigers out to a 17-1 lead and the next sideout. Umatilla crept up the score over the next several possessions to 10-22. Stanfield held control over the final three points for a 25-11 final score. The third game started off close with both teams scoring easily with Stanfield leading 6-5. Stanfield then pulled away to a 13-7 lead just before the midway point. Stanfield then pulled away to a 21-9 lead. Umatilla's Kaitlyn Kennedy serves lead to the Vikings closing to 23-12. The Tigers poured on the power to finish out the game 25-14. 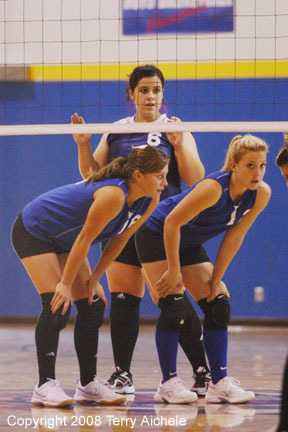 LEFT - Stanfield senior Mikayla Baros takes her place at the net while Umatilla frontline players Kassandra Kennedy and Katelynn Schaefer-Cranston prepare for their serve. 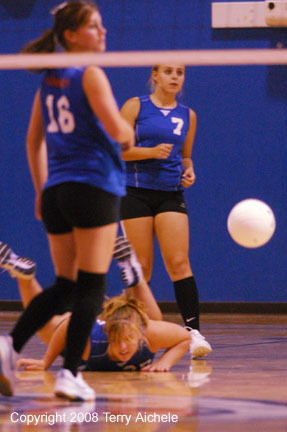 RIGHT - Kaitlin Kennedy of Umatilla goes to the floor in an attempt to keep the ball in play during the first game. 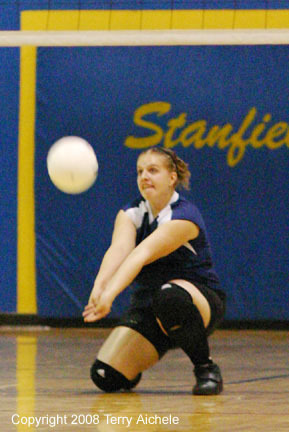 LEFT - Umatilla senior Kaitlin Kennedy attempts to block a shot by Stanfield's Tara Nichols during the first game. 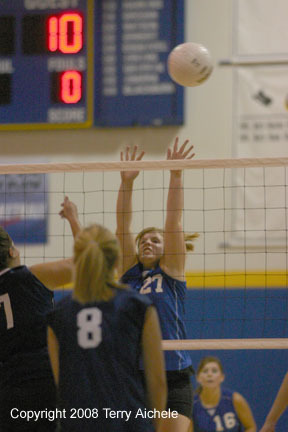 RIGHT - Umatilla's Kaitlin Kennedy tries to spike the ball past Stanfield's Tara Nichols. 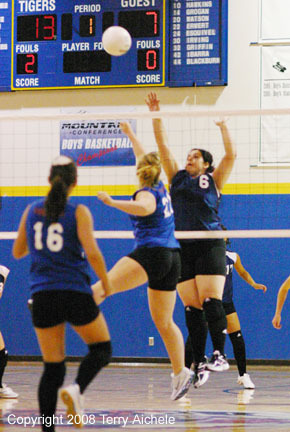 LEFT - Stanfield sophomore Alysa Sobotta blocks the shot by Umatilla's Kaitlin Kennedy. 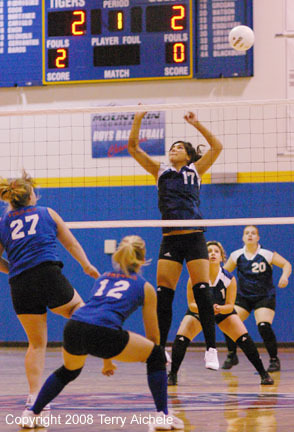 RIGHT - Stanfield sophomore Carly Valadez goes low to dig out a serve from Umatilla. 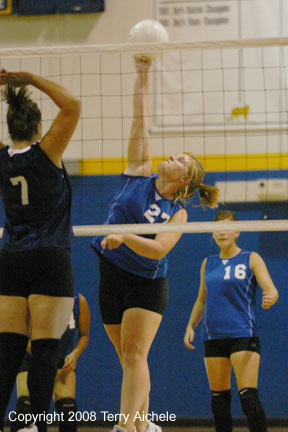 LEFT - Stanfield senior Mikayla Baros battles for a block along the net. RIGHT - Tiger MIkayla Baros battles Viking Kaitlin Kennedy at the net.